Well site location should first be based on hydrogeology, but many other factors come into play. NOTE: Much of the contents on this page has been adapted from publications of Lifewater International, written by Fred Proby. Property owners and the people who will be using a water well will often base their choice of well location on the convenience of the site. Understandably, a well located right outside their door would be desirable. Practically speaking, this may not be possible, and well site selection almost always involves some kind of compromise. A couple of other considerations concerning well location become very important in our efforts to produce a dependable source of clean, safe water. First of all, the drill rig being used must be able to penetrate the formations in the area and reach groundwater within the depth limit of the rig. Secondly, wells must be located far enough away from latrines and other places where human and animal waste is concentrated to prevent the introduction of disease-causing pathogens from entering the well water. 1. Direction the groundwater is moving. 2. Distance between the bottom of the latrine and the water table. 3. Type of soil between the bottom of the latrine and the water table. Following these guidelines (or any well site placement guidelines) will not guarantee that a well will be free from bacterial contamination. The well must also be properly constructed and the well water tested to assure the best possible water quality. 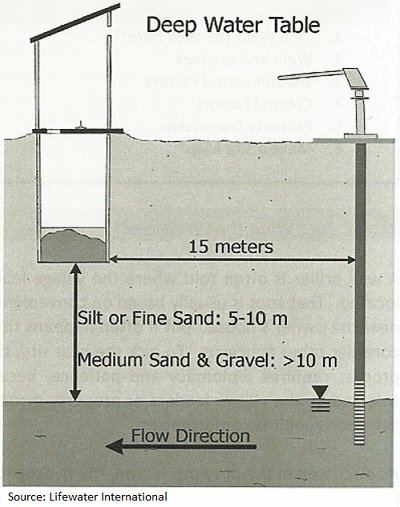 If groundwater flow direction is known, it is best to place the well up-gradient from a latrine, so that contamination moves away from the well. It may be difficult to know the direction of flow. But, groundwater in an unconfined aquifer tends to flow in the direction that the ground slopes, and it flows from a recharge area to a discharge point. Knowing this, it will usually be better to locate a well uphill from a latrine than downhill from one. The distance between the bottom of the latrine and the water table and the type of soil that lies between the bottom of the latrine and the water table will determine the minimum safe separation distance between the latrine and the well. 1. There is clay, silt or fine sand between the bottom of the latrine and the water table. 1. There is medium sand or gravel between the bottom of the latrine and the water table. 2. The well is located at least 15 meters from the latrine. If the bottom of the latrine is at the water table, or close to it, then disease-causing organisms can get into the ground water. Finer grains soils, like clay, silt, or fine sand can more easily filter out pathogens than coarse sand or gravel. So, the minimum safe separation distance is shorter for the finer soils than it is for the coarse soils. In either case, if flow direction is known, it is best to put the well up-gradient from the latrine. 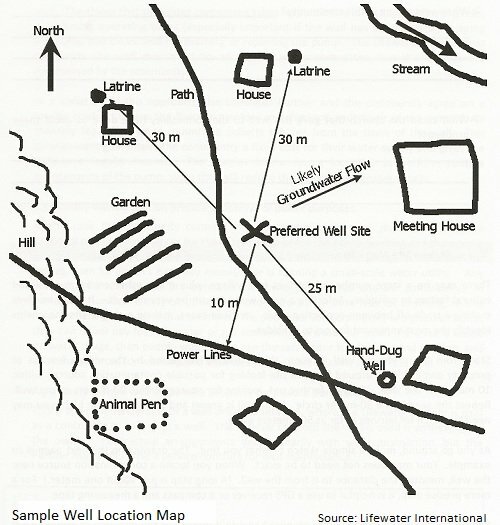 We have already discussed some environmental factors involved in locating a water well, so some of the items in the list below will look familiar. A few other factors must be noted. These environmental factors are natural phenomena that are not the result of any human activity. 1. The direction that groundwater flows, as noted above, is a very important environmental factor to know. A well should be placed so that contamination from any source moves away from the well and not toward it. 2. The type of soil near the surface is also important. As mentioned, clay, silt, and fine sand can keep contaminants from reaching the groundwater. 3. Surface waters, like streams, rivers, and ponds, may contain biological, agricultural, or industrial contamination so wells should be located at least 15 meters away from them. 4. Avoid areas that get flooded, since people cannot get to the well to the well during times of high water and the well may be contaminated by floodwaters overflowing and seeping into the well. 5. The well site should be elevated enough to direct surface runoff away from it. 6. Saltwater intrusion can affect shallow groundwater near the coast, so wells should be placed away from shore or drilled into a deep aquifer. 7. Naturally-occurring chemicals, like arsenic, boron, and selenium can affect groundwater quality, so water should be tested in areas where this may be a problem. 1. Proximity to where people live. Convenience is a very important factor to consider when locating a well. Studies have shown that when a water point is located less than 200 meters from a home, people tend to use more water than when the source is farther away. They drink more water and wash more often, which con tributes to better health. 2. If there are more people who want to use the well than the well can support, people will not have enough water for good health. One well for every 300 people is an appropriate goal. A large village may need several wells in order to experience all the benefits of clean water. 3. Are there areas in or around the community that are considered sacred? It is wise to respect the “spiritual landscape” of the area as viewed by those who live there. You may not share the community’s beliefs, but it is a demonstration of love to be sensitive to theirs. Asking about these things with gentleness can help build good relationships. 4. A cemetery is an especially sensitive cultural issue. In some places, people have refused to drink water that comes from the ground because people were buried in the ground. There is no real risk of contamination if a well is located a safe distance up-gradient from a cemetery. However, the perception that people have is a more important consideration when choosing a well site. 5. Even a small village may have a well thought-out plan for growth. So, consider what future development may take place in the village and locate the well in a place that will not conflict with that growth. 6. Some communities have cesspools or large seepage pits that receive much more human waste than a family latrine. 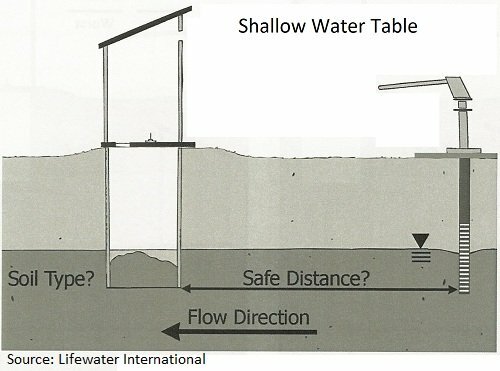 A well should be placed at least 50 meters away from such a concentrated contamination source. 7. Animal pens concentrate waste in a small space and are similar to a latrine in their potential to contaminate groundwater. Use the “safe separation distance” criteria as you would for a latrine. 8. Industrial facilities or garbage dumps may discharge harmful chemicals into the soil and groundwater, so wells should be located at least 100 meters up-gradient. 9. A well should be no closer than 7 meters from overhead power lines, because the lines could be touched when installing or repairing the hand pump. 10. Before drilling, identify any underground pipes that might run near the well site. 11. If a new well is placed too close to another well that is still being used, they may interfere with each other. This can reduce the amount of water that each well is able to produce. The appropriate separation distance depends on the pumping rate of the wells and the characteristics of the aquifer. 12. An abandoned well may be filled with trash. Since it probably reaches to the water table, this can be a serious source of groundwater contamination. Use the “safe separation distance” criteria for a latrine that contacts the groundwater. Property ownership is a cultural factor that deserves special consideration. Wherever there are living and working there will be some sense of property. Ownership might be individual, collective, a mix of these, or something entirely different. In any case, it is not likely that property ownership will be evident to an outsider, even an outsider from within that culture. If you are involved in surveying and walking around trying to find the best location for a well, it is always important to ask permission before walking around and looking at things. It is best to be accompanied by a local leader so no suspicion will arise among those who may not know the purpose of your visit. An essential part of the process of selecting a well site is determining property ownership of the well and access to the well. There are three arrangements that tend to be successful, as described below. But, these are not the only ones that will work. The key is for the community to discuss the issue and agree on a solution before the well is drilled. In this arrangement the involvement of the community leaders is essential. Typically the Village Water Committee is elected by the community to administer all aspects of the well. The things that the Water Committee takes responsibility for include; collecting fees, establishing operating times (especially important if the well has limited yield), keeping the pump pad clean, and maintaining and repairing the pump. The organization or individuals who construct the well may need to advise the Water Committee, but the policies are determined by the community. In a variation of the above approach, the local constructors of the well and the community may agree on a service contract where the constructors provide maintenance and repair of the pump for a monthly fee. The Water Committee collects this fee from the users of the well. This arrangement guarantees the community a fixed cost for their water supply and gives the local constructor a regular income. The constructor has a strong incentive to perform routine maintenance on the pump, since that will reduce the need for expensive repairs. In this case, the community contracts the responsibility for well maintenance to the property owner, who charges for that service. He keeps the pump working and the people pay a reasonable fee for the water. If he doesn’t maintain the pump, or if he cuts off access, he doesn’t earn any money. He is running a small-scale water utility. Any contractual agreements are between the property owner and the community. In some communities it may be difficult for the leaders to impose any kind of fees, so this arrangement gets around that problem. The people of the community are given a choice; they can either pay for safe water or get contaminated water for free. If the fee is based on water usage, then people will tend to use the safe water for drinking and cooking, and use other sources for washing and activities where water quality is not critical. Community decisions concerning well ownership and community use of the well play an important role in deciding the best location for a well site. There may be a large number of latrines in a community, plus many other environmental and cultural factors to consider. Selecting a well site can be very difficult. It often involves making a trade-off between conflicting goals. In these cases, making a simple map helps identify the most important factors to consider. Start from the preferred well site location; this is usually suggested by community leaders or property owner. Walk around the well site looking for possible sources of contamination within 10, 20, and 30 meters of the well. If the soil is gravel and the water table high, you may need to search for contamination sources as far away as 500 meters away. Make a simple sketch of what you find. The map does not have to be exact. Measure distances from the well site for each source of contamination you find. Take topography into account because it influences the direction of groundwater flow. If you find a source of contamination too close to the proposed well site, then discuss the problem with the community leaders or property owner. Help them consider a better well site. Work with them to find the best place for the new well, given the restrictions of the environmental and cultural factors. Remember that finding the best well site often requires tact and compromise. Return to "Groundwater" from "Well Site"